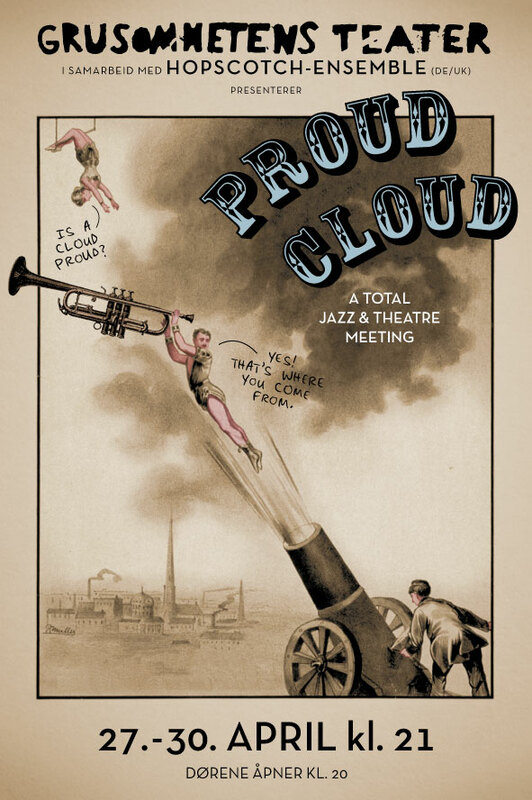 In cooperation with Hopscotch-Ensemble (DE/UK) Grusomhetens Teater presents PROUD CLOUD. A total jazz and theatre meeting. HAUSMANIA – Hausmannsgate 34. Oslo. "If the brass wakes up as a trumpet, it is not to blame"
Muscial fireworks at Grusomhetens Teater! The legendary jazz musician Tristan Honsinger (b.1949) from Berlin with his Hopscotch ensemble and Grusomhetens Teaters performers will, during the period 27. till 30. of april, present a muscial circus on the stage in Oslo. The project is based up on the meeting between freejazz music and theater. Musical situations – melodies, songs, noice meets theatrical tableaus which plays togehter or go their seperate ways. The stage at Hausmannsgate is populated by 15 performers, women and men formulating their existential journey. The Scenography changes during the performance, new landscapes appears, new horizones conquers and all the time the sky is blue: – a sky of greatest importance. Tristan Honsinger is considered as one of modern european jazz most important innovators, and since the middle of the seventies he has contributed in many international crews. Hopscotch bestows not only of jazz musicians, but also two actors and the Butoh dancer Hisako Horikawa.